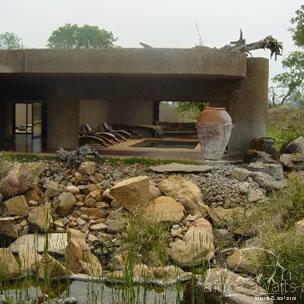 Earth Lodge is a sanctuary symbolising a new era in luxury South African safari lodges. Sculpted into a slope of the earth, almost invisible in the landscape, the lodge uses texture, light and space to present a lodge like no other. Earth Lodge reveals itself in a series of sensory revelations. On arrival a hidden corridor leads you down on a journey to a unique and unforgettable experience. 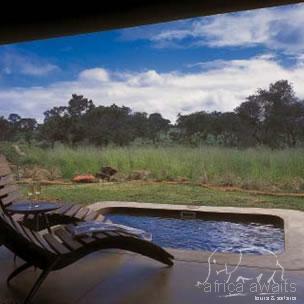 The unexpected entrance opens to a panorama of uninterrupted bushveld. As in nature everything at Earth Lodge exists in harmony and you are immediately aware of a sense of calm and a restoring spirit. Home to 13 ultra-luxurious suites including the Amber Presidential Suite, the lodge breaks with traditional bush lodge style to create a masterpiece of artistry and innovation. Each of the suites at this luxury lodge features individually designed furniture, private plunge pool, en-suite glass fronted bathroom, indoor and outdoor shower and butler services. The natural wooden sculptures by renowned South African artist Geoffrey Armstrong add a powerful magic. 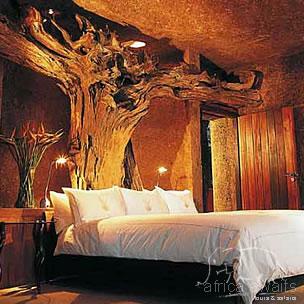 With your holiday, safari or business trip from in to Sabi Sabi Earth Lodge in Kruger National Park.